With a slow moving front passing across the Solent today, so the fleet competing at the RORC’s IRC Nationals were subjected to one of the windiest days they have seen so far this season. 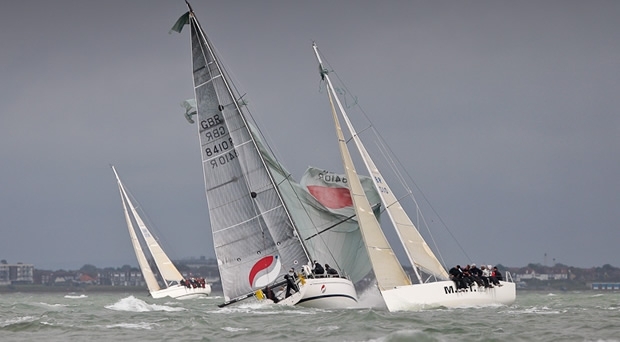 Three races were held on the central Solent and with the wind gusting into the 30s for today’s final encounter there were a multitude of DNSes and DNFes. While there were at least two dismastings on the Solent, fortunately the carnage in the IRC Nationals fleet was limited principally to sails and fittings, while those that did last the course were to be commended for their prudence, the majority for example choosing not to hoist the kites in the blustery final race. Bekking said that they continued to use their spinnaker today but the lighter weight asymmetric boats, able to hoist large genoas on the reaches, were able to sail four or five knots faster than they were. For the most part today Antilope came away unscathed, although they suffered a small rip in their mainsail. Antilope was one of only five boats in IRC 1 to complete the final race. Crucially one of the DNFs was Jonathan Goring’s overnight leader, Keronimo, so the lead in the highly competitive IRC 1 has now passed to Anthony O’Leary and his Irish Rolex Commodores’ Cup winning crew aboard the Ker 39 Antix. Of course loving today’s brisk conditions was Dutch salty seadog Piet Vroon, skipper of Tonnerre de Breskens 3, who’s 3-1-1 scoreline was the most consistent of the day. His blue hulled Ker 46 now holds second place in IRC 1 two points astern of Antix and two ahead of Keronimo. With more breeze forecast for tomorrow, Tonnerre could be in with a good chance of repeating her IRC Nationals class victory from two years ago, when she was just four weeks old. While Johnny Vincent’s modified TP52 Pace continued her unbroken string of wins in IRC 0 against Rob Grey and Sam Laidlaw’s Farr 52 Bob, both choosing to stand down from today’s final race, so in IRC 2 Peter Rutter’s Grand Soleil 43 Quokka 8, now has scored a phenomenal six bullets in as many races. Fighting for the remaining podium positions going into tomorrow’s final two races are Nicolas Gaumont-Prat’s First 40.7 Tradition Philosophie IV, Jim Macgregor’s Elan 410 Premier Flair and Richard Fildes’ Corby 37 Impetuous. MAT 1010 retired from that race but bounced back to win today’s breezy third. In one gust Morton said they had seen 34 knots and at one point when they had the kite up they clocked 19 knots – not bad for a 33 footer. With Chris and Hannah Neve’s No Chance disqualified from yesterday’s second race due to a start line infringement that ended up in the protest room, followed by an OCS in today’s second race, so the leader in IRC 3 is now Mike Bridges’ Elan 37 Elaine. Bridges says that Elaine likes “anything between 12 and 20+ knots, but 30 is probably a bit much!” Today they managed to avoid too much carnage although the conditions did take their toll and they blew out a fitting for the vang. “We had to replace that on the way. Otherwise there was nothing major,” said Bridges. In IRC 4 Adam Gosling’s Corby 30 Yes! has been propelled into the lead following bullets in today’s final two races, while yesterday’s leader Michael Kershaw’s Half Tonner Chimp was one of four boats in the class to bow out of today’s final race, dropping her to second. A final two races are scheduled for tomorrow and at the forecast at present is showing at least as much wind as we have seen today.